On a wintry day hot chocolate is the ultimate comfort in a cup. It sure is wintry here today and cold. Bone chillin' COLD! Wind factor below zero kinda cold. Hat, scarf, mittens, ear warmers, double socks kinda cold. Bitter eye-watering, nose hair freezing, fingers going numb kinda cold. It's pretty darn cold. So what do we do in my house? Make homemade hot cocoa! Doesn't everyone? I am not a fan of those little white envelopes you buy 10 servings to a box. I think they taste like a watered down bad chocolate bar. I would rather go without than to drink an inferior cup of dirty water, so I make my own hot cocoa. Not only does it taste 1,000 times better then the little envelopes, this recipe makes a lot and when stored in a mason jar, it will keep for a good long time on the shelf (at least 6 months). Not that mine will last that long during the cold winter months. You'll also save yourself a lot of money....this mix will only set you back 17 cents a cup. Jesse named the Mocha version Moco-Cocoa, so that's what we call it now. Kinda has a ring to it. In a food processor fitted with a knife blade, blend all the ingredients. I sifted all my ingredients before I put them into a mason jar, just to be sure I didn't have any lumps. 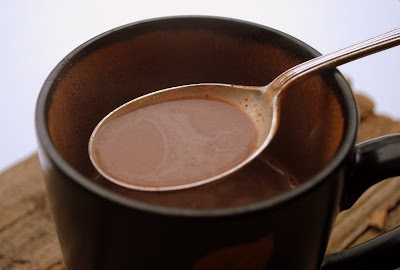 Mix 1 cup of milk with 3 tablespoons of the cocoa mix and microwave on high about 1 1/2 to 2 minutes. Depends on your nuker. Stir and enjoy! Homemade marshmallows are the perfect topper too! Here are a few variations you can try. Add any of these to your basic mix. The Mocha is my favorite. It's like drinking a great chocolate bar in a cup. Once you make your own cocoa, you will never go back to the little blue box. Mocha Variation: Add 1/3 cup instant coffee powder or granules. I don't see why you couldn't add instant espresso coffee also. That would be good! Mexican Spice Variation: Add 2 teaspoons of ground cinnamon and 1/4 teaspoon of ground red pepper (cayenne). Vanilla Variation: Add a half of a vanilla bean, pod & seeds. We gotta know....did your friends make it thru the snowstorm to help you celebrate? My kids have to make it back to Connecticut on Saturday. I'm hoping for a warming, no storm, no wind trend. Yes Debbie they made it, lol. They said the roads were in pretty good shape by the time they headed to my house. We're pretty good at plowing here in RI. Today is just bitterly cold, but there's no snow forecast...until tomorrow! That's New England for ya! It's bone chilling here as well. 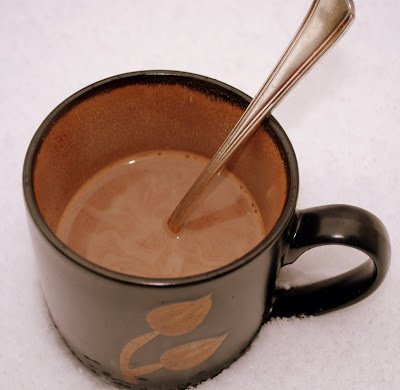 this cocoa sounds perfect for today...I do believe I shall make some. Bring on the Moco-cocoa and Happy new Year to you! Seeking sweetness in everyday life.